During an attempt at ice skating at the Sculpture Garden in DC, I had one of these wonderful moments where life seems to speak to you through the so-called “ordinary” moments. Watching the happy faces – of every age, race and color – go round and round, I couldn’t help but admire the beauty of humanity and wonder why it is so hard for us as human beings to live together and share this world. 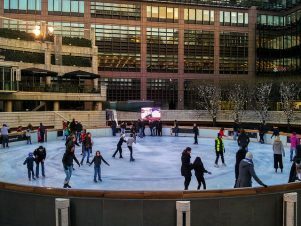 I noticed that within the boundaries of the rink the skaters naturally formed themselves in three circles. The outermost circle was formed by those closest to the railing – the novices who never skated before, parents and little children, and even some young people with an older body, who didn’t have a problem trying out this new adventure. Lacking the confidence and skill these skaters on the outermost circle held on to the railing for their dear lives, although once in a while one dared to let go to try and skate in the wild for a short while. The second circle was formed by those who took a leap of faith and let go of the railing, fumbling slowly, accelerating and braking, accelerating and braking, learning the fundamentals of independent movement. Once in a while they would splatter on the ice, but without hesitation, they would bravely get up and keep on going, practicing the realization that to fall and to get up is a natural part of learning. Finally, the innermost circle was formed by the majority of skaters, those who have been in the rodeo quite a few times, and skated relatively freely, enjoying the sensation of speed while learning new tricks. Their mastery of the skill has helped them overcome their fear… or was it the other way around? There was a also a fourth class of skaters, just a few, who had already gained complete mastery of the art and were just skating rapidly between the other skaters, zigzagging between the circles, totally enjoying the freedom that mastery brings. Among this fourth class were the guards who skated around making sure everybody obeyed the few simple but necessary rules, preventing people from endangering themselves and others. What was exceptional about the whole situation was the absolute patience and respect shared by the skaters. Nobody pushed, nobody derided the slower skaters, and nobody put themselves in the way of others. It was a beautiful harmony of different velocities and levels. Living in this world, the one the Hindus called Samsara, is perhaps more complicated than a simple ice rink. But also in the ice rink of life we share the common pursuit of a mastery – the mastery of those skills that allow us to live life to its fullest. In this pursuit, I think there’s a lot we can learn from the harmony of the ice rink.